Bonsoir fans from beautiful Paris. I hope you are very well in your lives. I am. This evening I played my third round matches against a French person. After the match I was told that I was Mahut’s idol. I was surprised to be asked this hence My response of, “It’s happened before.” It was a little silly statement I believe. It’s like asking the Queen of England if she is looking forward to her Jamboree this weekend. Apparently his nickname is The Hoot but to be honestly, I did not find him very funny. I did gift him a sets but if anybody is doing the thinking that I lost this you are very much of the mistaken. Yes. You will check my Twitter feed and make the notes that one of My fans asked Me to gift him one set before the match and I replies that I would. However! Even without such promises to my fans I did have a little scary fright earlier during the afternoons. I just had a shower in preparations for my big match in the rooms with the lockers. As I came out I heard lots of people shouting, “Le Willy, Le Willy”. I quickly covered Myself with the towels and made a blushing before realising that they were watching the Tsonga match. That was a close calling! I must admit that I am a little down in these moments. Normally Stanford WallRinger (… a real dead ringer for love… ), my fellow Swiss countrymans, and I usually hang out together. We used to be BFFFs and go out and make the parties. It was so much fun and the making of the memories. But ever since St. David’s Cup earlier this year he hasn’t spoken to Me. I am not sure why. Maybe it was something I said? Either way I think it’s quite disappointing. I sent him a text message earlier from the FedBerry but it got sent back to Me, “Return to GOAT”. I must go soon as Chef has advised dinner will be served and then I will rest. June 1, 2012 in RolandGarros. 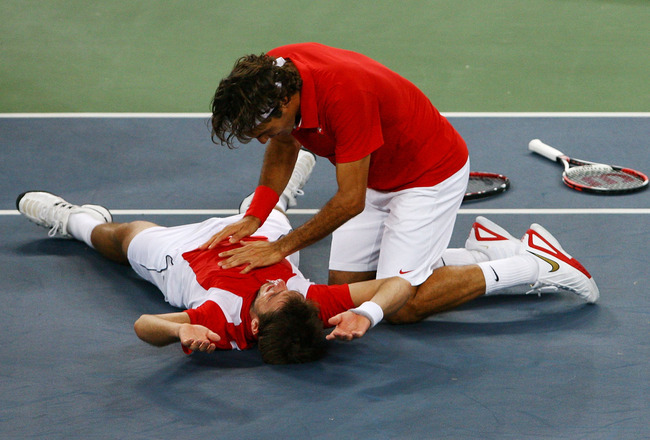 I don’t believe it was Mahut that said you were his hero. I think it’s your fourth round opponent that said it. Could be wrong though. I really shouldn’t even be questioning you. You are correct, it isn’t appropriate to question Me. Although I admit it’s so confusing sometimes. Mahut said his wife and family are all My fans, and my next opponent likes me too. They are not the first, and not the last. Thank you Ms Today for your comments.